Cats love valerian, so do plant some in your garden. 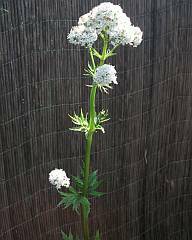 Valerian (Valeriana officinalis, Valerianaceae) is pleasant-looking hardy perennial plant, producing spikes of pink or white flowers. Red valerian is a different species - cats prefer garden valerian. Valerian is native to Europe and Asia, but it grows well in South Africa. A dry, stony soil produces more essential oil in the root, but the plant will die if not watered. Cats & rats love valerian! Cats like the smell of the root and leaves of valerian. They may lie beside the plant contentedly. It seems to have a calming effect. Other cats may paw at the plant, or eat it. The chemical in the plants that attracts cats is actinidine. Some say the root smells like cat urine, some say it smells like sweaty feet. But in the garden, the smell is not noticeable to humans. The flowers have a delightful, heavy perfume and have been used in perfume. 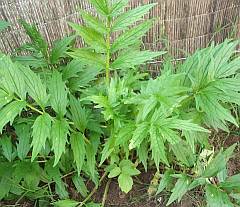 Rats also like the smell of valerian, and may eat the plant so buy more than one plant, or protect it from rodents! Cats are delighted if rats visit the garden. They enjoy hunting for rats, or just looking at them for entertainment. The dried, powdered root of valerian is used by humans for insomnia and sleep disorders such as awaking from sleep during the night. It may be necessary to take valerian for a few weeks before any difference is experienced in the time taken to fall asleep. Valerian tea can be made by pouring almost-boiling water on the powdered root. Or a tincture can be made thus: put the root in a glass jar and pour on cold water or fruit juice, to just cover the root. Keep it in the fridge & shake it every day for a few days. Strain, and take a swig when feeling stressed. Alas, digging up the plant to use the root will kill the plant, but you can try dividing the root and replanting a piece. The root is stringy like onion roots. Hosing it with a jet from a hosepipe speeds up cleaning. It is also used as a sedative for anxiety. It has helped those who wish to stop smoking. It is also said to help stomach pains. Do consult a doctor before using herbal medicine. Pregnant or nursing women should not take valerian, neither should children, as not enough scientific tests have been done. It should not be consumed before driving or operating dangerous machinery or power tools. It should not be used along with alcohol or other drugs. It should not be used prior to surgery as it may interfere with the anesthetic. If you can't drop off to sleep, read the Bible! It will either bore you to sleep, or fill you with the peace that passes all understanding. A prescription for insomnia is to read Philippians chapter 4, verses 4 - 9. Write it out and read it three times a day. Here it is, "Don't worry about anything, but by thankful prayer let your requests be made known to God. And the peace of God, which passes all understanding, shall keep your hearts and minds through Christ Jesus. Think about whatever is true, honest, just, pure, virtuous, or praiseworthy... and the God of peace will be with you." Another plant that cats like is catnip.